The photo-series The Ruins of Detroit by French photographers Yves Marchand and Romain Meffre dramatically captures the haunting and spectacular beauty of a once great American city. The photographs highlight the height of Detroit’s rise in the early 20th Century, and the depth of its decline in the 21st. 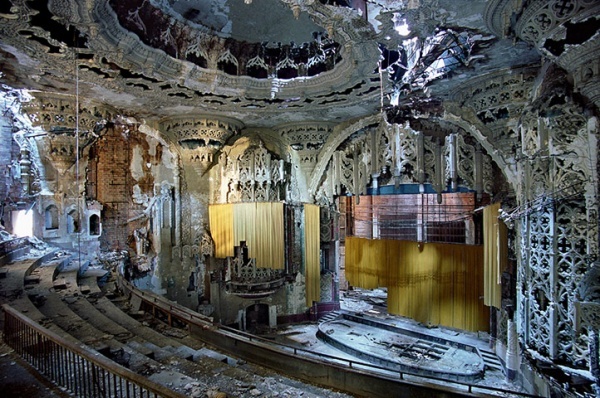 The photographs depict abandoned buildings such as the formerly opulent United Artists Theatre and the East Side Public Library. Individually these photographs are striking works of art. Together they create a powerful and disturbing portrait of American decline, urban decay, and loss.